A picture is worth a thousand word. But if you can present the words themselves as a picture, it’s worth even more. To make this art easy and fun for everyone, this week, Word Cloud is joining the growing Power BI custom visuals family. The world of unstructured data is having explosive growth now with text content. you see text everywhere in the social media be in product reviews, comments, messages, announcements or even simply with status updates. While Traditional charts and visualization techniques are great at making sense of structured data, they generally fall short when it comes to textual data. We often have to look for creative new ways for presenting text data. Word Cloud makes this experience exciting and fun in Power BI. 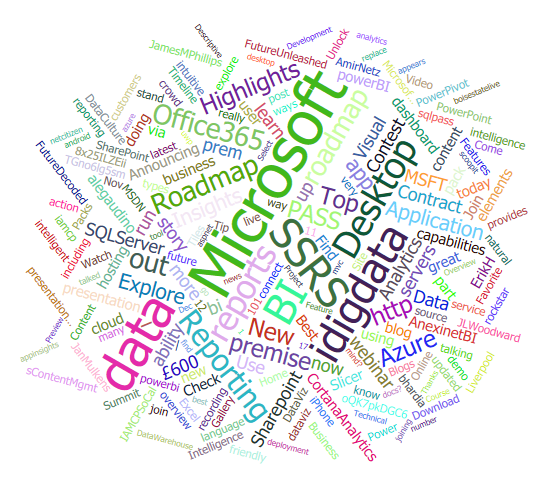 Word Cloud is slick and adds a new dimension to the Power BI custom visuals experience. Check out this video to see this in action. To use, simply import the Word Cloud from the Visuals gallery to your Power BI report and use it with a text column. Optionally you can also use a measure to provide weightage to the text. If none provided, it will simply use the frequency. Check out the formatting pane for more options. Now, go, try it out and have some fun and explore your unstructured text data.